We all have heard the story of the Little Red Riding Hood. We all know how the story ends. But do we really know how it begins. Do we really know what led the wolf to do what he did? This is his story. To truly understand the wolf’s story leading up to that pivotal moment when he met the Little Red Riding Hood we have to go back…way back to where it all started! And so our story begins in the Land of Westeros – a land of fierce beasts – beasts so ferocious they would devour anyone in their path, beasts best left to their own devices. But the thing about Westeros was that it was rich in Tiberian – a resource revered by the High Council and crucial to maintain the balance of power across the galaxy. A resource that had to be retrieved at all costs. For this reason the High Council chose their finest Jedi’s for this perilous mission. When the Jedi got there, they were in for a battle unlike anything they had expected. The beasts guarding the Tiberian were powerful, even more than the great Jedi. Soon the beasts overwhelmed them all, sparing no one! The Jedi Master only survived because of our wolf who came to his aid by putting his life on the line. It was this act of bravery that led the Jedi Master to take him under his wings. The High Council was not pleased with his decision, but the Jedi Master put his reputation at stake to accept the wolf as one of their own. So he trained the wolf in the ways of the Jedi, despite being a wolf he was treated as an equal and quickly rose to become one worthy to be called a Jedi. And so everyday he would fight to uphold the values of the Jedi – values like respect, equality and perseverance. But not everyone felt the same about him and questioned his right to be among the Jedi. There was this one particular princess among the elite who looked at the wolf and his kind with great contempt. She couldn’t believe that a wolf could live up to the values of humanity. How could he? He was a wolf after all. And so she sought to expose the wolf for what he was all about. She endlessly plotted and looked for ways to bring the wolf down. She eventually dug up a little secret about the wolf. The wolf once had a family. You see the wolf came from a land where his kind was hunted to be either enslaved or killed. One such attack on his pack had left many giving their life to protect the young. His daughter was on only one that survived from his family. One day as the wolf was on a border mission protecting the land of men, the princess sent a rogue assassin to have his daughter slayed! The wolf returned to learn of this sorrowful news. Enraged the wolf sought to seek revenge and wreak havoc on all those responsible. The princess knew the wolf would seek revenge and killing his daughter was not really her goal. She disguised herself as a pauper on the street and intercepted the wolf, telling him that a bunch of rogue assassins are responsible for this ordeal. She directed the wolf to their location and told him where they would be camping out at night. In his fit of anger the wolf tracked the caravan and as all lay asleep he burned the tents and everything in sight till the flames engulfed everyone alive. Little did he know that the caravan he burnt to the ground was not a caravan of rogue assassins but a caravan of women and children exploring the wild flowers in the forest. Despite his desire to impart justice the princess had misguided him to do the unthinkable! Word of his doing reached the Jedi High Council. The Jedi Master couldn’t believe the wolf would do something like this. He wanted to reach out to him but the High Council called on all Jedi’s to hunt the Wolf and put him down at all costs. Broken and hunted the wolf was on the run. At this point he did not care for his life, he just wanted to know who was behind all this and put an end to them if that was the last thing he ever did. But he didn’t know where to turn to. Everywhere he went he was scorned and hunted with no one to trust. He lost all hope and turning himself in was the only way to end his misery until the Jedi Master found him. Not only did he find him but he figured out who the assassins were and who had paid them to kill wolf’s daughter. And so he learnt the identity of the princess. Her name was Rubrum – the princess with the Red Cape. Consumed by this knowledge and his grief the wolf tried to find a way to inflict his revenge. 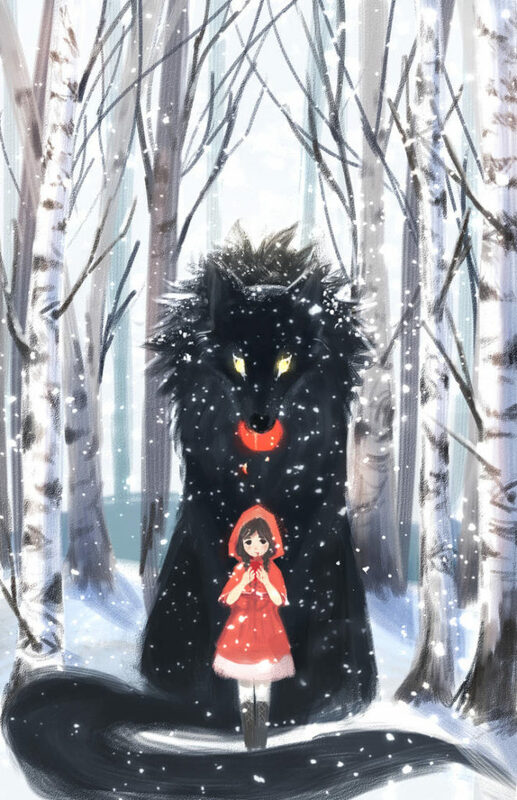 Unable to reach the princess with the red cape the wolf now old, weary and deranged wandered aimlessly through the forest until one day he came across…the little red riding hood!